When you are at work, what is the thing that people talk about all the time? They talk about it, they complain about it and they are tired of it? I’ll tell you, it’s stress. And not necessarily only in the workplace, stress can appear in any setting, doing any activity, making you feel overwhelmed. But what is stress? 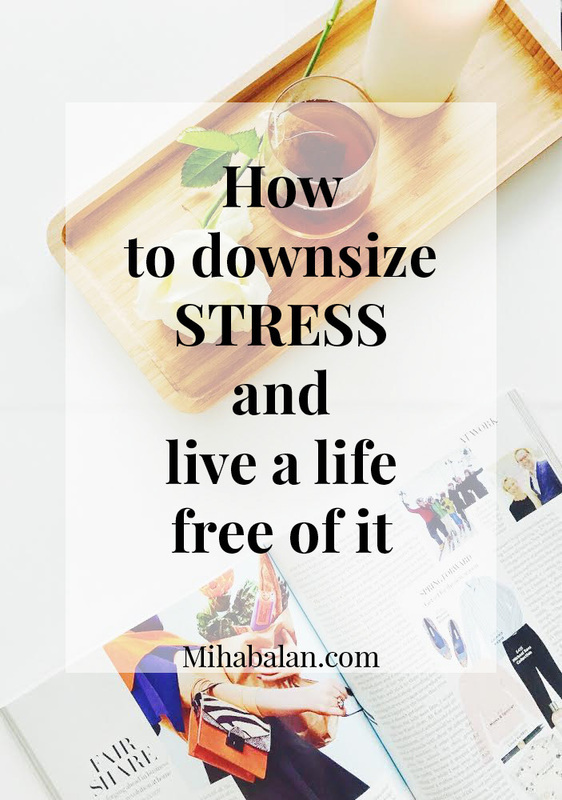 How can we downsize stress and live a life free of it? First lets recap the medical definition: stress is an emotional strain or tension resulting from adverse or demanding circumstances. Stress can be both physical and emotional. It can be caused by worrying, fear of misfortune to you or your family, job issues and endless other causes. In this article I would like to talk about the most common variant, workplace stress, because I have been through this myself and I learned some lessons that I would like to share with you. Stress affected both my body and mind, and it caused some changes in behaviour that I didn’t immediately recognize at the time. I was constantly eating so obviously I gained weight and it seemed to never want to go away. Not only was I eating a lot but also wasn’t eating healthy because I was constantly craving carbs. I also had a hard time sleeping at night. I would spend hours thinking about an issue and when I did finally sleep it wasn’t very restful. This started a vicious cycle as during the day I was constantly tired and found it hard to focus. It changed my attitude towards people. Often I would be grumpy or thinking about something completely different than the situation I was in, causing people to find me detached. Stress also affected my life outside of work, I found my spare time hard to enjoy since work issues would constantly be on my mind. Have you ever experience any of these symptoms? Being busy at work usually means that things are going well and you’re seeing success. Remember there is a difference between being busy and being stressed. For example, in my current work, blogging for you guys, I am almost always busy the whole day, but I am not stressed. I sleep like a babe at night now. Stress manifests in many different ways, so you may not experience exactly the same, but if you feel like stress is taking over your life, then thinking back on my experience this is what I wish I had done. What situation is causing you stress? Analyze it, write it down and try to see the big picture. Is it really that bad? Sometimes when we are under stress we tend to see the problem in a different perspective, even more exaggerated than it actually is and the more you think about it the worse it feels, right? Once you get clear to yourself what causes you to stress so much the next step is finding the solution to fix it. Focus on the solution not on the problem. Wake up an hour early in the morning so then you will have time to enjoy your coffee slowly, maybe read a newspaper, make yourself a nice breakfast and try to think of positive affirmations to start your day. If you need any help with that, Paula from thirtheenthoughts.com wrote a whole article about positive affirmations that I think you will enjoy. Once you get home try to not think about work. If you have a partner I think it’s important to let it all out and for the partner to listen and support you, but for a limited time. Afterwards, enjoy your evening or get busy doing something else that can take your mind of work. Surround yourself with happy people. Did you notice that there are some people that constantly complain and most of the time find the negative in everything? And then there are those people that are always excited about small things and just being around them brings you joy and energy? Introduce fitness in your life. We all know that exercising has a lot of positive side effects that can help refresh our brains and keep us healthy. I am not a fan of sports but I do go out for walks. A small walk in nature or just around a neighborhood that you like can improve your mood. And my last advice to you: Don’t take life so seriously! Is this problem that is causing you stress now, something that you will remember in a year? I don’t remember why was I wasting my time thinking about problems at work, all I remember now was that I could’ve been doing something else. There will always be dark days when you feel down or you just feel like you can’t make it out alive or nothing works right (I had one of those yesterday) but with good support and motivation you can get through them. It is up to ourselves to bring positivity into our lives and try to make each day worth it.